Product prices and availability are accurate as of 2019-04-11 18:59:09 EDT and are subject to change. Any price and availability information displayed on http://www.amazon.com/ at the time of purchase will apply to the purchase of this product. PASSION FLOWER: Passion flowers are exotic looking topical plants that can actually be grown in much milder areas. There are many different passion flower plants. Some passion flowers are vines, some produce edible fruits. The genus Passiflora contains over 400 species. 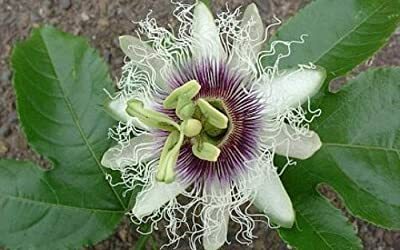 The name 'Passion' Flower comes from Spanish Christian missionaries who adopted the unique physical structures of this plant, particularly the numbers of its various flower parts, as symbols of the last days of Jesus and especially his crucifixion. Unusual yet beautiful 3 inch flowers, followed by edible fruits after a hot summer. A self clinging climber from Brazil. Suitable for greenhouse, conservatory, houseplant, or outside against a sheltered wall. Flowers early summer to autumn. Hardy in zones 8-10. In cooler areas it can be brought inside as a houseplant in the winter. The flower is said to represent the Crucifixion. 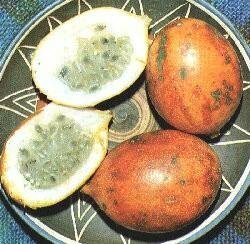 The fruits are also edible. Used as a flavoring in drinks, desserts, sauces, and many other foods. Grown around the world, produces egg sized fruit filled with wonderfully tart, bright orange pulp.